Anna has been involved in the Early Career Educator of Color Leadership Award since its inauguration in 2008, mentoring and supporting new members into the work of NCTE. In addition, Anna has been a member of the NCTE Secondary Section Steering Committee, the CEL Executive Committee, and many NCTE committees. 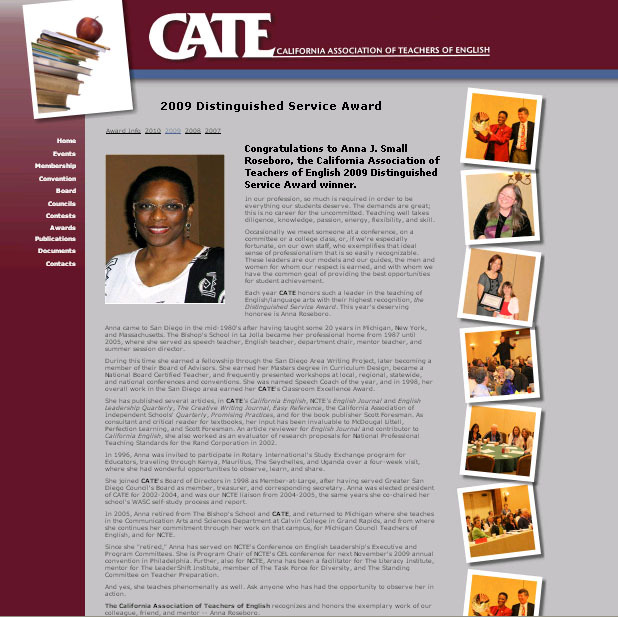 From the very strong letters of support offering specific examples of Anna’s suitability, it’s clear that she exemplifies the full criteria for the award in exceedingly positive ways: service to NCTE in various capacities, service to the teaching profession at large, scholarly accomplishment in multiple venues, and excellence in teaching at various levels. In addition, she has proven herself to be a dedicated mentor and support for teachers at all stages of their careers, further exemplifying her dedicated and distinguished service to NCTE and the profession. Years of experience as a teacher have taught me that on-going professional development and enrichment are essential to increase educators’ knowledge, skills, attitudes and beliefs so that they can assist students in reaching high levels of learning. Professional development that is most effective in improving educator practice is results-oriented, data driven, constructivist in nature and job embedded. Professional enrichment includes regular meetings with eager, enthusiastic educators who are experiencing success and satisfaction along their career path and planned gatherings that allow for both structured and unstructured conversations. It’s relationships that increase retention in this vocation. Thanks for satritng the ball rolling with this insight. Great post. I was checking continuously this blog and I am impressed! Very useful info specially the last part 🙂 I care for such info much. I was looking for this particular info for a very long time. Thank you and good luck. I simply want to mention I am newbie to blogging and site-building and really savored your blog. Very likely I’m planning to bookmark your website . You amazingly have outstanding articles and reviews. Thank you for revealing your web site.